How Much Snot Can the Body Produce? over 4 Cups a Day! We all have it, produce it, and most of us find it disgusting. It’s snot. The green, white, yellow and sometimes clear mucus discharge from our noses. While not many of us find the subject, or the product an inviting subject to talk about, have you ever wondered how much snot can the body produce? At certain times, such as during a cold of hay fever season, the body, or nose seems to go into overdrive. It’s often during these times that many of us ask the burning question, how much snot can the body produce, because during a cold we must surely be approaching a limit of some kind. It’s not that clear cut an answer to be honest. How long is a piece of string? Is the cup half full or half empty. The answer can literally be anything. Just as with these questions, snot production on an individual basis can vary. Some people are like the industrial workhorses of the snot manufacturing world, while others are the more laid back observer types. Those are the lucky ones in my book. 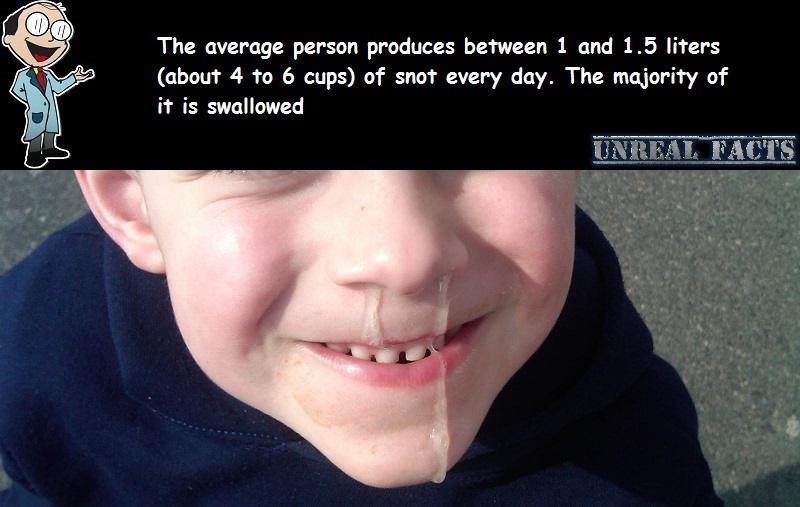 But while snot production does vary from person to person, the body still manages to turn out on average a disgusting quantity of the nasal mucus. So exactly how much on average? The average person produces between 1 liter and 1.5 liters (4 to 6 cups) of snot each and every day. I know. It doesn’t seem even remotely possible does it? There’s no way that we use a tissue that often. If we did, waste bins would be overflowing with disgusting used tissues the world over. During times where the nasal passage has been stimulated by a cold or irritant, production tends to skyrocket. So where does it all go? So we know that we make a hell of a lot of snot on a daily basis. It’s a disgusting quantity to be honest. Some of it we discharge with sneezing, but that’s only a very small amount, mere droplets on each sneeze. It might disturb you to learn that the majority of the byproduct falls back down your throat. That’s right, you swallow snot. But why do we produce so much snot? As awful as it is, it’s a vital part of the human body. Snot acts as a bit of a filter for the body, and being a warm liquid, it aids in heating up the air that you inhale. Without it we would be more susceptible to environmental contagions, and airborne infectious diseases.